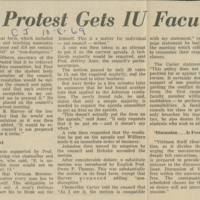 "Student War Protest Gets Faculty's Blessing"
Statement issued by faculty members and administrators who were present during the Ballantine Lock-in. They state that at no time was violence threatened against them, and the meeting was in fact beneficial for all parties. 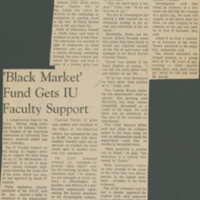 "State Joins Probe in 'Market' Blaze"
Newspaper article discussing both the faculty plea for funds to rebuild The Black Market, and the ongoing police investigation into the firebombing of The Black Market, which occurred on December 26, 1968. 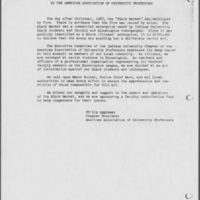 Statement issued by the Indiana University chapter of the American Association of University Professors expressing shock and dismay over the firebombing of The Black Market. 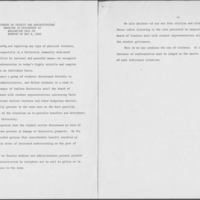 Taken from IU Archives' reference file "Black Market Fire - Dec. 26, 1968." 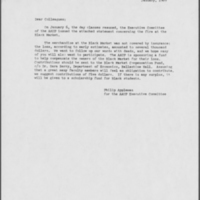 Circular soliciting donations from faculty members to help out the owners of The Black Market in the wake of its firebombing.